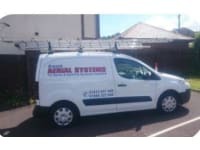 Gwent Aerial Systems ,based in Newport is an established business with over 20 years experience, which prides itself on a reputation for providing a prompt reliable service. Specialising in the installation and repair of aerials and satellite systems. We cater for a wide range of solutions, from Radio to TV, from Freesat to Sky. We are committed to creating the best solution for you, at the best possible price, to achieve the best TV Aerial and Satellite reception. Had terrible signal problems with my aerial in the loft. Gave Les a call and he came and did an excellent job. Installed the aerial on the outside of my home, ran a new cable through, and even reset my BT Youview box for me. All for a reasonable price too. Other aerial companies quoted me much more. Can't recommend Gwent Aerial systems enough. Thank you Les. Top man.